“A train, a real train, is above all a moment of time. A timeframe, suspended between two cities. Like the whites between two chapters. Benoît Peeters. Locorail presents original drawings from the comic book La Douce, conceived by François Schuiten and published by Casterman. The book, the first one Schuiten finished all by himself, tells the story of a driver's totally unreasonable affection for his locomotive, the ”12“ (the fastest of its time). François Schuiten adores trains. Just glance at all of his previous books, and you’ll appreciate that it is virtually impossible to set up a comprehensive list of all locomotives and/or trains he drew. Nonetheless, we’d like to refer to Rail, Express, or l'Archiviste. Moreover, he was asked to conceive the design for the exhibition on the Transsyberian railway, a part of Europalia Russia in 2005 and, more recently, to do the stage setting for the new Belgian railway museum. The Autrique residence now lets its visitors get acquainted with the legendary “12”. The “Atlantic”, a type 12 locomotive, is one of the finest machines ever built in Belgium (at Cockerill et associés in Serain). The first machine came into service in 1939. With its aerodynamic boiler, futuristic view, sophisticated technology and three pairs of huge wheels (each with a diameter of 2 meters), the six surviving examples are the jewel to the crown in railway collections. Where better than to the house of engineer / surveyor Eugene Autrique, who himself designed railways in the early 20th century, can rail fans come to in order to be immersed into the world of trains past and present? Whilst visiting this exhibition, they can set off on an unforgettable journey through time and space. A different, immobile journey however. The steam locomotive « Atlantic type 12 » belongs to the historical heritage of the Belgian Railways. 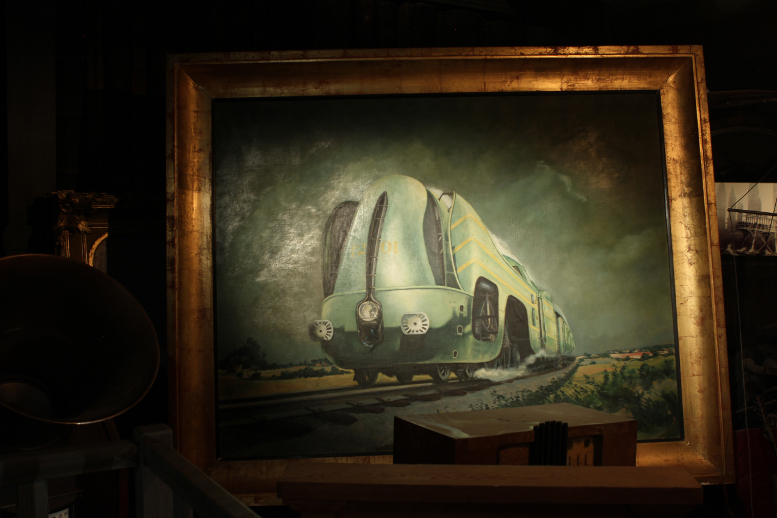 It will be one of the main features of the future Railways Museum which is foreseen to be built in Brussels. This blog post was created on 2012-04-22 at 12:08 and last modified on 2018-02-18 at 10:34 by Joseph Le Perdriel.